Consumer appetite for smartphones and mobile-first business strategies are likely to create ongoing demand for mobile communications infrastructure across the globe, but some markets that are already saturated will start to evolve and transform in the coming years. Market maturity creates new opportunity. Western European mobility revenues are expected to reach $224.8 billion in 2017 -- that's a mere increase of 0.1 percent over 2016. Purchases of mobile hardware, software, and services are expected to grow more stably in 2019 and 2020, with a compound annual growth rate (CAGR) of 0.4 percent during the 2015–2020 forecast period and reaching $230.3 billion in 2020. Mobile connectivity services currently represent almost 50 percent of European mobility spending, with consumer counting for more than 73 percent of this tech category. Hardware, driven by smartphones, follows, taking 42 percent of the mobility market in 2017, a share expected to decrease to 37 percent in 2020. Software, although delivering just a tiny portion of the full mobility spending, will be the fastest-growing area, fueled by enterprise mobility management applications and mobile application development platforms, both expected to grow at a 19 percent 2015–2020 CAGR. "A majority of European companies are still behind the curve in their adoption of mobility solutions but we believe 2017 will mark a turning point for many," said Angela Salmeron, research manager at IDC. Companies will likely accelerate their mobile strategies. The digital economy is forcing companies to innovate and be more agile to market changes. The threat landscape and regulatory compliance, chiefly GDPR, is requiring security to be included in the early stages of any mobility initiative rather than being an afterthought. 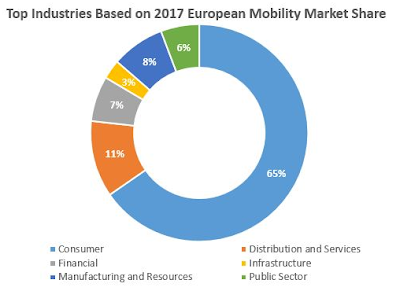 Regarding the business sectors most likely to fuel new demand, banking, discrete manufacturing, and professional services will drive the European mobility market across commercial industries, counting for more than 35 percent of spending (excluding consumer) in 2017 and throughout the forecast period. When looking at growth rates, government, followed by utilities, will show the fastest growth with a 2015–2020 CAGR of around 6 percent. Consumer will be the only segment of this market with negative growth for the coming years (-1.6 percent 2015–2020 CAGR) -- negatively impacted by the expected decline in hardware purchases. From a country perspective, the UK is the largest mobility market in terms of revenues, followed by Germany and France. The top 5 European countries (the U.K., France, Germany, Italy, and Spain) currently represent 73 percent of the mobility market. The Netherlands and Italy are expected to lead market growth in 2017. Nevertheless, when excluding consumer spending, Denmark, followed by the UK, will show the highest 2015–2020 CAGR (6 percent).